This lovely bit of modelling is Black Hall Sidings, Simon Andrew's O9 layout which has been featured on the Gnatterbox before here: http://forum.gn15.info/viewtopic.php?p= ... 9de1a66744 , I think it's Autumnal theme and colours are a great setting to play trains and photograph stock. Simon approached me after I had advertised my interest on the forum for a 9mm gauge project a little while before. Initially I had to turn him down because of personal issue at home but thankfully they were resolved quickly leading to me discussing the conversion of the layout to Gnine. We came to the conclusion the layout would convert very nicely with little more than a couple of detail changes to be made. 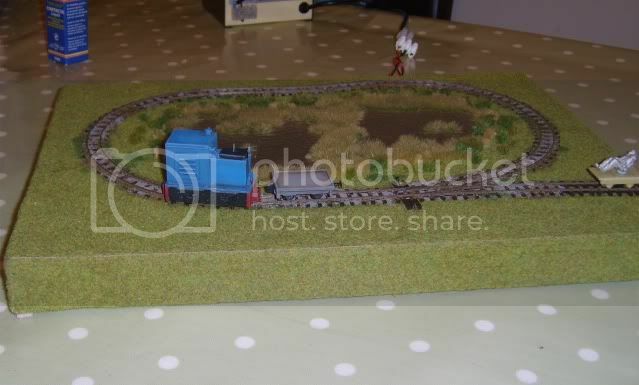 I have always fancied having an inglenook layout to play with so before you knew it, I had the layout at home within a week. It was a little like Christmas. The only changes I plan to make are to the building on the platform really, obviously replace it with a g-scale one and removing the fencing and gate from the back behind the trees. They're now back and secure in place. Last edited by demaine22 on Tue Apr 16, 2013 3:00 pm, edited 3 times in total. I liked seeing this layout in it's O9 guise, look forward to seeing it develop into it's Gnine phase! Thanks for the comments chaps. I was considering making the building removable so I could possibly switch between Gnine and O9 – would something like that even work? Last edited by Bilco on Tue Jan 17, 2012 6:55 pm, edited 1 time in total. Quite agree, that first shot looks great. It's only the buildings that give the others away. Great layout, which I had the pleasure of seeing in the flesh. Looking forward to new developments! 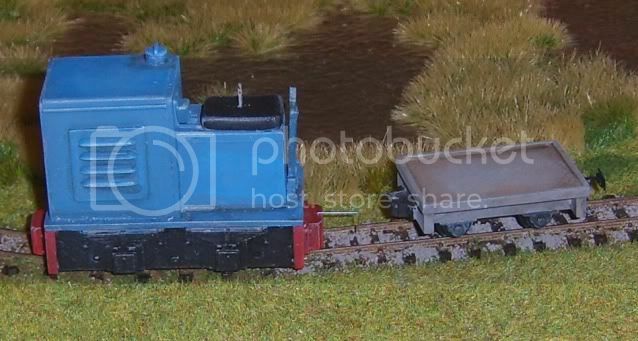 As we discussed you may want to use a shunter's wagon due to the radius of the approch curve if using standard length Sidelines / Avalon chassis (my O9 locos were all shorter). I use a short Sidlines flat with a fixed link at one end and a Greenwich coupling at the other. I use a staple, often shortened as the fixed link. My Gnine locos use the cast couplings as supplied in order to negotiate tight radius curves. The curves on the test track below are as little as 31/2". First of all, thank you every one for the comments on the idea of a dual-scale layout, I hope to start on the Gnine structure tonight, something along similar lines to the O9 version, just a little taller and using G-scale printies. Like your test track, I may try something similar one day. Here is a little update on the building progress. I have managed to get the old 09 building up without doing too much damage, there was only a bit of brick paper torn where glue had come from the bushes nearby. Once the way was clear I put my plan into action for shed building and posed the lads and their engines together for a size comparison. So I have decided to lower the height of the building a little and see how that goes, if I am still not happy with the look of the building I may try something different to fill the gap. Very neat - just by changing the building the track gauge narrows but the vegetation still looks right! I guess removing one plank would make the building look right - have you got a standing figure of the right scale to compare? Bilco wrote: Very neat - just by changing the building the track gauge narrows but the vegetation still looks right! I guess removing one plank would make the building look right - have you got a standing figure of the right scale to compare? Don't forget that some store sheds were lower than 6ft high. They just made them big enough for the tools. Looking good, I like the new shed. As for a standing figure... could you print a photo, scaled to the correct height? Stick it to some thickish card, on a suitable base... should be fine for test purposes. By the way... your drivers appear to have one clean , and one dirty shoe each! Is this part of your cunning plan? Cross Kitter wrote: Don't forget that some store sheds were lower than 6ft high. They just made them big enough for the tools. MrPlantpot wrote: As for a standing figure... could you print a photo, scaled to the correct height? Stick it to some thickish card, on a suitable base... should be fine for test purposes. Nice idea! I like that, I can sort that on my lunch today..good call! Wonder if by extending roof (sort of covered platform) over transfer area, you might change the effect. Building at present appears as same size and shape as a Privy. Its function as a RR building needs to be more clearly defined to the viewer. Following on from Chuck's comment that would be easily achieved if the roof was merely a single minimal sloping one rather than the conventional pitched roof currently modelled. Such a roof IMHO is more suited to the size of the building. Gerry Bullock wrote: Following on from Chuck's comment that would be easily achieved if the roof was merely a single minimal sloping one rather than the conventional pitched roof currently modelled. Such a roof IMHO is more suited to the size of the building. You could easily extend the platform by building a floor that is supported by the outer wall of the shed and the two roof supports. This again merely covers the undergrowth without altering it for use on the smaller scale. Ah I think I see now Gerry, (using the pic as a reference) do you mean come out to the side of the building (where the corrugated iron is) to allow a larger building? That way I could put a loading door on there? Yes, however not a larger building, rather a covered area over an extension to platform built onto the building with the two post supports for extended roof passing through the platform and fitted to baseboard with pins in base of posts. Thataway I think you could achieve a larger unit without significantly disturbing your existing groundcover. I use the method of pins in posts to locate the water barrel shelter on Secciole Salina. With a lot of recent time being dedicated to getting better (I've had a bad neck for a couple of weeks – better now!) I didn't really have much time to model comfortably – looking down tended to set off a nice bit of pain for hours so it was best just leaving everything until I got better. Finally I woke up magically cured after a nasty cold came out...bit odd. Anyway finally moved on to messing with buildings – and messing is the best word to use really – lots of trial and error brought around a new idea for a 'brick' structure instead of a wooden one. Please excuse the pics, my camera sprouted legs and disappeared! The new building sits with a timber extension on the side – currently borrowing a roof. So now with a new roof and timber decoration around the top edges, I decided the thin to do was to move on and add some colour. And then with the extension added. The wooden part seems to be quite dark at the moment, I'll try to lighten it up before applying any varnish. I intend to add more colour to the timbers of the new building until I am happy – I also forgot to show a shot of the front showing the door! To finish a shot with the now two painted locos and the chaps in their first coats of colour! Apart from the shed I have also re-applied the trees as some came loose again, one broke and so I took it apart and added it to the layout as weeds/bushes. Cheers Gerry, proper pictures of other new details to come.